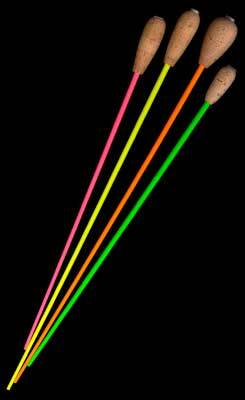 The Mollard Brite Stix™ Conducting Batons are available in Hot Pink, Lemon Yellow, Brite Orange, and Lime Green. Ideal for the budget conscious shopper who demands high quality. The 12" fluorescent batons are available with Small or Medium Size Handles. The 14" batons are available with Medium or Large Size Handles. Medium size handles are normally in stock while the small or large size handles may need to be specially ordered depending upon color. Please scroll down for more information about these batons. - Counter-weighted for that famous Mollard "feel"